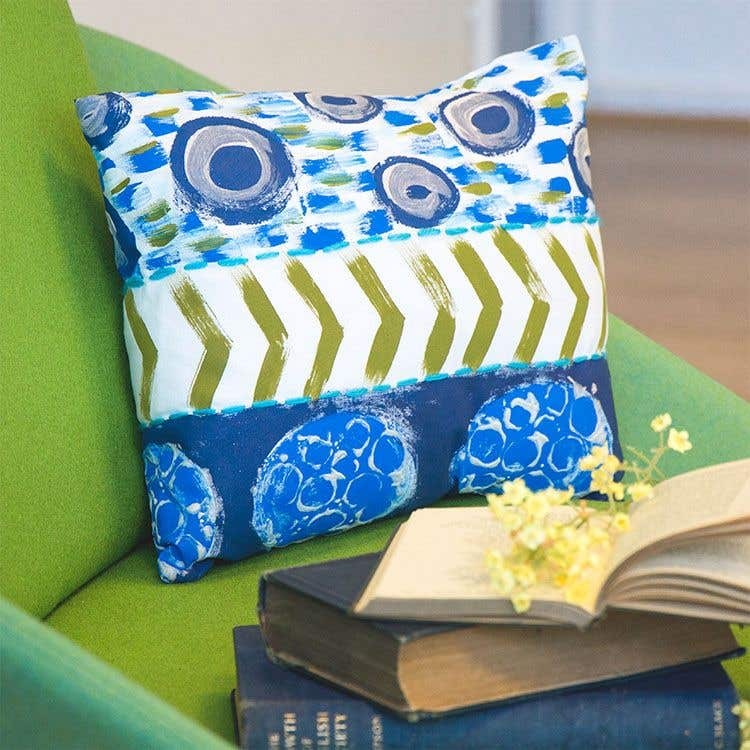 Use sweeping brush strokes to create this beautiful textured cushion, perfect for the coziest corner in your home. Lay the teatowel out flat, and measure the cushion inner against the shortest edge. Cut the tea towel so they are the same width. Draw two lines to separate the fabric into 3 sections. 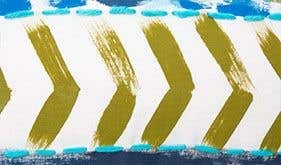 Use pebeo opaque olive green paint to paint v shapes down the middle section. Use a hog hair brush to get the rough brush stroke effect. 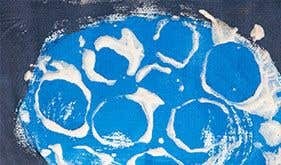 Use the blue opaque paint to paint large rough circles down the left hand side. Next mix a dark blue and fill in the space on the left around the large circles. 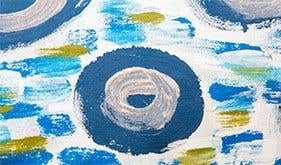 Use the same dark blue to paint smaller circles on the right hand side. Use blue, olive green and white with short vertical brushstrokes to create the background pattern on the right. Allow to dry thoroughly. Using the white suede effect paint, paint rough circles on top of the small blue ones. The paint will appear translucent. Coat the lotus head in white suede effect paint with a brush. Press firmly on top of the larger blue circles. Reload with paint when necessary. Allow to dry thoroughly. Set the paint by placing the design face down on some clean fabric and iron for 5 minutes over each area. The suede paint will become opaque and raised. Add details in turquoise thread. Sew the cushion cover together inside out. With it laying in front of you in a portrait position, design facing up, fold the top edge down about ? of the way. Fold the bottom up over the top so it overlaps by a few inches. Stitch the two open edges down the left and right side. Turn inside out and fill with a cushion. Use a hog hair brush to create bold sweeping brush marks.